Around the last quarter of 2009, a small group of retail traders finally got sick and tired of fake system sellers, ignorant teachers and systems that don't work. They decided to show the metaphorical finger to all the so called gurus and masters of forex trading world. They got together, formed a Skype group, Developed and Refined a Trading Strategy that works. A strategy with a positive expectancy and a statistical edge. And so they decided to trade the hell out of the forex markets. Its been one hell of a ride. But never gave up... They all share one thing. They all want to change their life for the better forever. Do You have the Burning Desire to Change Your Life? You have at your hands an opportunity to learn a simple yet powerful trading strategy. AIMS Stress Free Trading Strategies have been tried and tested by thousands around the world with great success on all kinds of markets, including stocks, futures, commodities and currency markets. Markets are dynamic and they keep changing constantly. Every moment in the market is unique and the market will never be the same. But AIMS Stress Trading Strategies are based on a structure that remains almost always the same. Yes, the markets always have an underlying structure. The underlying structure of the market remains almost the same even though the outer levels of the might change a bit here and there. AIMS responds and adapts constantly to the changes in the market. AIMS Stress Free Trading Strategies allows a trader to read and analyse the market from a micro and macro perspective and that is a very powerful attribute. With AIMS Strategies you shall find and partake in very lucrative trading opportunities. You will learn how to apply trading Chaos to Forex on shorter time frames and longer time frames. No matter you have an hour of time available to trade or the whole 5 days of the week you have choice of AIMS Stress Free Strategy to suit your style. AIMS Stress Free Trading Strategies presents solution for Scalping, Intra-Day Trading, Swing Trading, Short to Medium Term and longer term Investing . It all depends on your choice. Your Goal as a Trader is to Achieve One Thing. "CONSISTENCY"
Your Objective is to Achieve Consistency and Consistency means you trade using a statistical edge, a proven methodology, over and over again no matter what the out come of individual trades because you know that the result of the next 20 or 50 trades will be a positive outcome. This is the Secret of AIMS Stress Free Trading. We teach you how to use your Mind. Have You Heard about the Following Statement before? We believe in probabilities. We believe in "Chaos". We also believe that making money in trading is a function of trading correctly. We at AIMS understand this and share with our Members how to trade correctly using a blend of Technical Analysis Techniques Combined with Mental Analysis Techniques. This unique blend creates a winning formula that changes a traders "Perspective" for good. Once you have the "a-ha" moment your trading life will never be the same. Money shall flow into your account as a by-product of trading correctly. 1. Learn to Understand the Concept. 3. Achieve Consistency by learning to be disciplined. 4. Understand and attain the correct Trading Mind-Set. AIMS Stress Free Trading Strategy offers 3 Entry Mechanisms: 2 Breakout Setups and 1 Counter Trend Strategy. Combined together provides a comprehensive trading edge and a complete trading strategy that caters for all kind of markets and traders. AIMS gives you a crystal-clear entry mechanism with a simple and easily understandable entry setup. AIMS Stress Free Trading takes the anxiety out of trading by applying three simple rules to create two clear entry setups. We know our entry level within a second. 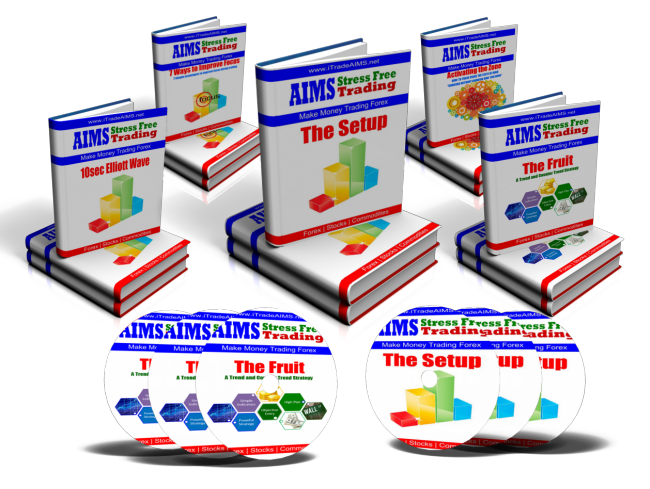 The success of the AIMS strategy is based on its sound money management techniques. Our money management and risk control helps us increase our return on investment. AIMS money management and risk control take into account the market conditions. The AIMS strategy allows you to increase profitability when you have winning trades and give little away when you have a negative trade. AIMS techniques allow you to control your risk to a bare minimum and provide a potentially higher risk-reward ratio. We believe that trading is at least 80% mental. The ultimate goal of a trader is to achieve the state of “Knowing without Knowing how You Know”. It is that mental state that we call “The Zone”. The correct mind-set and attitude is the key to trading success. We have two simple techniques to help you remain calm and stress free during trading. A Proprietary and Unique AIMS Indicator. Visually Identify Exact Entry Points. Ultimate Indicator for Setting Stop Loss and Trailing Stop. Shows the Structure of the Market. Risk disclosure: There is a substantial risk of loss in trading futures, options and forex. Past performance is not necessarily indicative of future results.